Do I Need Diagnostic Testing Or A Vehicle Inspection? by The Mechanic's Wife | Feb 16, 2016 | Did You Know? Your throat feels like you just swallowed a cactus and your head is a balloon that’s about to burst. Your chest is on fire and coughing just makes it worse. Welcome to the cold and flu season! Many of the patients in your doctor’s waiting room probably have similar symptoms, while others are there for completely different reasons. You hate going to the doctor but you just keep getting worse, so begrudgingly, here you are. For several of the patients in the waiting room, the doctor will ask questions and maybe perform tests to determine whether they ail from cold, flu, strep-throat, or something else. She’ll then prescribe treatment once the illness is determined. The process is not much different for your vehicle. When your car starts acting abnormally, such as consistent overheating, you are no more excited about going to your mechanic than you are the doctor. However, you need your car to function properly so you can get to work or the kids to school. You bring it to your mechanic to find out what’s wrong with it. You tell the mechanic the vehicle’s symptoms and he performs diagnostic tests. It could have been a myriad of problems, but he determines the cause to be a leaky radiator. It’s possible that the leaky radiator is repaired only to discover two months later that the vehicle begins demonstrating new symptoms, such as a whining noise when making left turns. Most likely, this new symptom is caused by a different problem, so you’ll have to return to your mechanic to have different diagnostic tests done. It’s like if you go to the doctor for walking pneumonia in February and return again in April for a stomach bug. You don’t expect the doctor to do the same testing or prescribe the same treatment for two completely different symptoms. Nor do you assume that the symptoms are related. Thankfully, your doctor is an expert on the human body and its systems, just as your mechanic is an expert on your car and its systems. 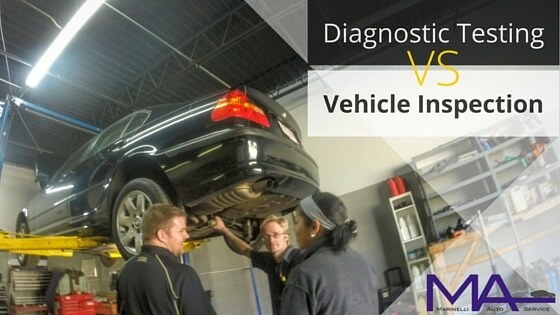 Diagnostic testing is not to be confused with a vehicle inspection. You don’t typically bring your vehicle in for diagnostics when there isn’t anything obviously wrong with it, right? Let’s go back to the doctor’s office for a minute. There you sit, feeling and looking miserable when a seemingly healthy woman walks in. She glances around the room, and she sort of rolls her eyes. Is she annoyed? Actually, this woman is seeing the doctor for an annual exam and the eye roll was not annoyance, but apprehension of catching your cold right before an important business trip later that week. The doctor will perform basic tests to determine her overall health. Maybe she discovers an abnormality and orders further diagnostic testing to determine if it’s anything to be concerned about. Hopefully she’s completely healthy and can go on with her life. While your vehicle likely doesn’t need an exam on an annual basis, it may need a thorough inspection to determine its overall condition. There are a couple different reasons why an inspection is warranted. You should always get a used vehicle inspected by a mechanic you trust prior to purchase. This helps you make an informed purchase. Also, it helps both you and the seller develop an unbiased opinion of the vehicle’s overall condition, which will assist you both in agreeing upon a fair price. Even if a few issues arise during the inspection, they may not be cause for passing on the purchase, but they may influence the price negotiations. Additionally, if you do purchase the vehicle, you have a good foundation for anticipating how much more money you will need to invest in the vehicle long-term. You can make a plan from day one for maintaining the car well and making the most out of your investment. Another scenario for needing an inspection may be that, after having put a few thousand miles on the vehicle, you want to plan repairs before they surprise you. For example, a thorough inspection of your vehicle may reveal a component that is about to fail, a few that will likely need to be replaced within the year, and a few more that should receive attention in the next few years. Rather than being surprised with several hundred (or a few thousand!) dollars of work later, you can budget for the repairs now and schedule them at your convenience. If you’ve jumped around from shop to shop or haven’t really followed a maintenance schedule beyond oil changes, it may be time for a thorough inspection. By establishing the shape of your vehicle’s many working parts, you can catch problems before they surprise you and plan further diagnostics and repairs on a timetable that fits your budget and schedule. Maybe, for the majority of the vehicle’s life (or since the pre-purchase inspection), you’ve been working closely with the same trusted mechanic who has a master list of maintenance and repair priorities for that vehicle. As long as you continue to communicate and plan with your mechanic, you may be fine without an inspection. Just like ignoring a health concern is not wise, neither is avoiding potential problems with your vehicle. Being aware of what your vehicle needs to stay in good condition retains its value and prolongs its life. Your vehicle may very well run strong beyond 300,000 miles if given the proper care throughout its life. Do you need to schedule your vehicle for service, to diagnose a problem, or get an inspection and make a plan? We’d like to help you get started!